The Ford F-150 Raptor is similar to many of the F-150s that you will find at Broadway Ford, but there is a difference. The F-150 Raptor is specifically designed by Ford to meet the demands of going off-road and driving on tough trails. This truck has what it takes to handle driving off the beaten path. To begin with, the F-150 Raptor has an engine with the power to go on the toughest terrain. The F-150 features a twin-turbo DOHC 3.5 liter EcoBoost engine. This engine produces 450 horsepower. This is the power that you need to go over rocks and pull through sandy conditions. 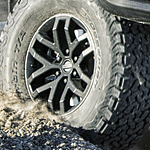 The F-150 Raptor also comes equipped with the Trail Control System. This system works a little like standard cruise control. With this system, you set your desired off-road speed. The system handles speed and braking. This allows you to place your full attention on steering the Raptor.